I fumble through all the little vials, tubes, and pots of goop my wife keeps in the medicine cabinet every day — regularly knocking them off and having to crawl behind the toilet to fetch them — but I’ve never really noticed what they were. Seriously: What’s in all this stuff? Here’s a photo tour of what your average woman is rubbing on her skin these days. This one must be good because it has three times the oxygen. That’s triple the amount of oxygen, people! The thing I don’t understand is whether this actually has oxygen IN IT or if it “releases oxygen.” Presumably oxygen is bad (hence “antioxidants” being good for you, right? ), but the label seems to have it both ways: fluidO2 is presumably liquid oxygen, no? Still, all the numbers and trademarks are impressive. It must be good. This is shampoo made out of cucumbers. Organic cucumbers. You are rubbing vegetables on your head. And “Dead Sea Minerals.” Spooky! Hey, I’ve got an idea! Let’s rub some tea… on my eye! The cabinet is filled with little packets like this, sample size stuff that never gets used. I like how this one admits right up front that it’s “alchemy.” I want to launch a line of cosmetics that promises to get rid of foul humours. Maybe sell organic leeches while I’m at it. Shea butter seems to be in everything. But cotton and karite? WTF is that? More stuff for your eyes. And what goes good with tea? Maple syrup, that’s what. (The fine print reads “Bio Maple;” thank God it’s not that digital maple.) For that sticky, gooey, just-washed feeling. 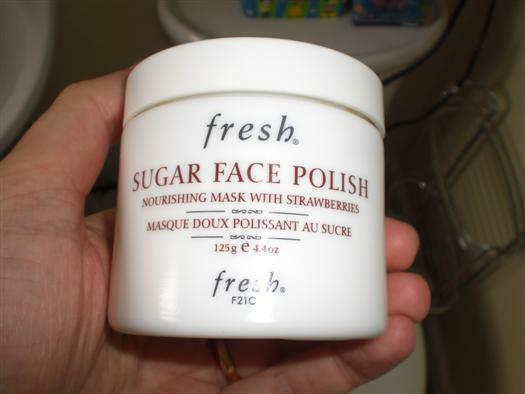 My favorite one I saved for last: Forget all that other stuff, this is a face soap made out of sugar! With a side of strawberries! Why not just rub strawberry ice cream on your face? Because it’s not French, I guess.